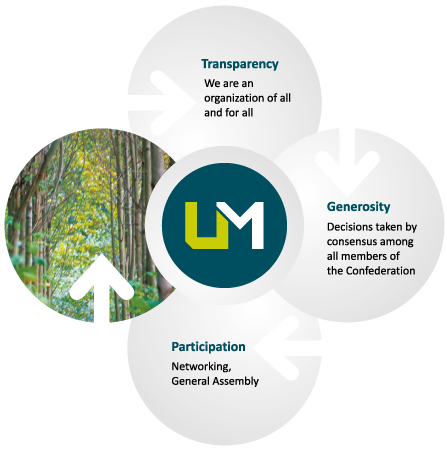 UNEmadera is a non-profit National Confederation of Business Organizations, which aims to promote the development and progress of wood and furniture industries. Its aim is to manage, protect and promote the general or specific interests of their member associations or federations, with the National Government, Autonomous Regions and all types of organizations, public or private, national or international, in general before any kind of third parties, as well as the representation of professional interests affecting collective member organizations of the Confederation. and collaboration with national or regional government bodies, as well as any other public or private, national or international entity. It is an organization of all and for all, hence every member knows all external and internal activities, and has access to every detail of any area of interest (associated, finance, organization, working papers …). All institutions that make UNEmadera, regardless of size, are involved in the decisions made in the Confederation. The consensus is a primary objective, always present in every presentation, discussion and argument, for all partners. Participation appears as the key networking of all member organizations to build documents, positions, arguments … The General Assembly is conceived not as a formal forum with an annual meeting but as a working tool, in which reflect on issues and decide between all.